The Reuters piece looks at the US repo market. Dealers and banks there are anxious about the spillovers of the potential Greek default (remembering Lehman triggered a run in repo) and this anxiety shows in higher repo rates. 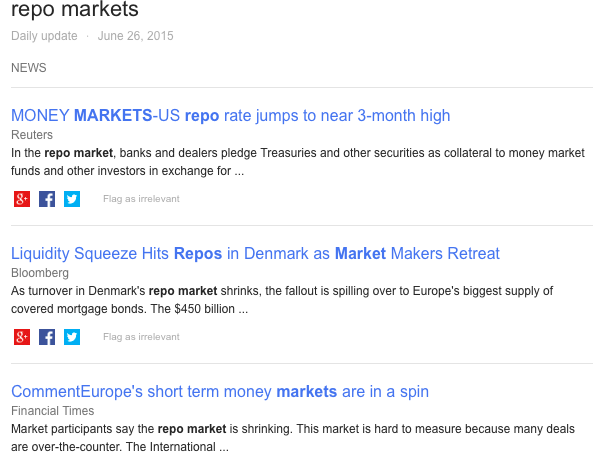 The Bloomberg article talks about the impact that the shrinking Danish repo market has on the covered bond market. Declining use of repos by banks harms liquidity in the secondary covered bond market, and threatens Danish banks’ liquidity buffers. Bloomberg cites the Danish central bank and local banks common view that regulation is discouraging\ banks’ use of repos, with unexpected consequences for the rest of the financial sector. As banks return to being more like banks (relationship based) and less like (repo) market players, financial stability suffers. The FT piece paints a very different picture. In contrast to the US, European banks and money market funds do not seem to be concerned about the financial stability implications of the Greek negotiations. The problem in European repo markets is how to get rid of your cash – as with negative bond yields, money market funds now have others to lend cash to them. The culprit, in this story, is the ECB, who charges banks on their reserve accounts, and thus distorts short-term money markets ‘driving our traders absolutely mad’. 1. How come Greek tensions manifest in US, but not European repo markets? Is it about the exposure of US to European markets, about the time horizon for tightening, or some form of inexplicable European optimism for a Greek solution ? 2. How can we account for, and separate, the impact of unconventional monetary policy and regulation on the repo markets? Bloomberg portrays the Danish central bank as unwilling to accept its contribution to repo contraction, whereas the FT piece has traders complaining about the ECB. This last question is fundamental given that repo markets are systemic to shadow banking. The FSB has recognised this since 2009, but its attempts to reform repos – to transform a market governed by private rules into a market governed by public rules (on haircuts) – have been watered down considerably. The European Commission and the ECB are also going down the same route, now content with simply imposing Transparency and Reporting Requirements (although some exceptions will also apply there) without trying to change margining practices that are inherently fragile. The Capital Markets Union (CMU) project also stresses that there is a trade-off between regulation and a well functioning repo market. Thus, the argument that regulation shrinks the repo market and constrains’ banks ability to act as market makers is very useful for delaying and defeating measures to regulate the market and bring it out of the shadows. When central banks start tightening, it may come to haunt them. 3. What are the broader consequences of increasingly organising the financial system around markets and market liquidity, as the CMU aims, in turn reliant on repo markets that not even the repo lobby knows much about? In two very influential papers, Reinhart and Rogoff (2010) and Reinhart et al. (2012) investigated the relationship between public debt and economic growth. By classifying the annual observations of their data set into public debt categories (low debt, medium debt, high debt, very high debt) and identifying public debt overhang episodes, they indicated that higher public debt-to-GDP ratios are related to lower economic growth. They also emphasised that this relationship is non-linear: although the debt-to-growth correlation is weak below the 90 per cent debt-to-GDP threshold, it becomes much stronger above it. As is well-known, these results were used by many policy makers in support of the austerity policies that have been implemented over the last years in various countries. In their popular critique Herndon et al. (2013, 2014) called the results of Reinhart and Rogoff into question. They pointed out three problems: (i) coding errors; (ii) selective exclusion of available data; and (iii) inappropriate weighting of summary statistics. They showed that when these problems are tackled, economic growth does not dramatically reduce when the public debt-to-GDP ratio passes the 90 per cent threshold. Reinhart and Rogoff (2013) responded by acknowledging the coding errors in their estimations; however, they disagreed that their weighting method is inappropriate and that they made selective exclusion of data. They themselves presented some corrected estimations according to which the negative relationship between growth and debt remains, but ceases to become stronger above the 90 per cent threshold. An interesting perspective to this debate is that the whole discussion about the relationship between public debt and economic growth would have been completely different if Reinhart and Rogoff had decided to focus on the adverse effects of low growth on public indebtedness rather than on the adverse effects of high public indebtedness on growth; in other words, if they had analysed their data set using a more Keynesian perspective that emphasises the role of automatic stabilisers and the direct favourable impact of a higher GDP on the debt-to-GDP ratio. In a note that I recently published (Dafermos, 2015) I show what their results would be in that case. Using the same descriptive statistics techniques that Reinhart and Rogoff utilised in their papers, I classify the annual observations of their data set into economic growth categories (low growth, medium growth, high growth, very high growth) and I indicate that the public debt-to-GDP ratio increases as economic growth declines. I also identify low growth episodes and I show that in most countries these episodes are characterised by higher public indebtedness. Therefore, if Reinhart and Rogoff had decided to present their data in this way, the main implication of their analysis would have been that growth policies need to be adopted by policy makers in order to avoid high public indebtedness; and not that policy makers need to focus on the reduction of public debt in order to avoid low growth. Of course, Reinhart and Rogoff are careful about this issue: they clearly state that their analysis does not capture causality. 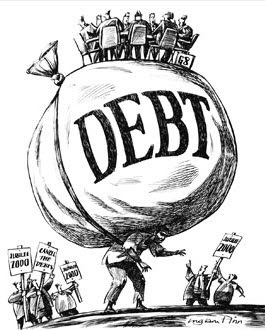 However, by classifying their data set into public debt categories and identifying debt overhang episodes they unavoidably concentrated on the growth-reducing effects of high debt, relegating the debt-increasing effects of low growth to the sidelines. On the contrary, if they had adopted a more Keynesian perspective, they could have focused on the debt-increasing effects of low growth. In that case, their conclusions, which informed the policy debate, would have been completely different. It is also important that the econometric research that followed the publication of their papers was substantially affected by the decision of Reinhart and Rogoff to focus on the growth-reducing effects of high public debt: most researchers have paid attention to the adverse effects of high debt on growth and not the other way round. Interestingly, the literature has not so far provided strong support to the causality from public debt to economic growth (see footnote 1 in my note). This implies that the empirical research needs to investigate the debt-increasing effects of low growth in greater depth; as would have probably been the case if Reinhart and Rogoff had decided to analyse their dataset using a more Keynesian perspective, or if they had explicitly presented both ‘halves’ of the public debt-economic growth relationship. The Capital Markets Union: faith in finance restored, contract with finance rewritten? Things are changing in European finance. Recent proposals by the European Commission turn post-crisis thinking on the regulation of shadow banking on its head. After Lehman regulators around the world agreed to curtail banks’ involvement in shadow banking, but recent policy initiatives frame shadow banking not as a source of systemic risk but as a crucial prerequisite for restoring sustainable growth in Europe. The Capital Markets Union (CMU) proposals aim to transform shadow banking into stable market-based finance, linking investors and savers with growth and employment. As the consultation phase has come to an end, it is clear that the CMU agenda will revive the two markets systemic to shadow banking – securitization markets and repo markets (where banks borrow short term against collateral). Two concerns arise. First, in its current form, the CMU is unlikely to advance its stated objectives. Second, the CMU risk undermining other efforts to regulate (shadow) banking. The CMU vision is securitisation-led growth, where tradable debt connects institutional investors with entrepreneurs in SMEs and elsewhere. Since European banks need to reverse the excessive pre-crisis expansion, market-based financing alone can meet the capital needs of companies throughout Europe. Revived securitisation markets are expected to free up bank balance sheets, create liquid mediums for institutional investors to hold; and spur SME lending and infrastructure investment. 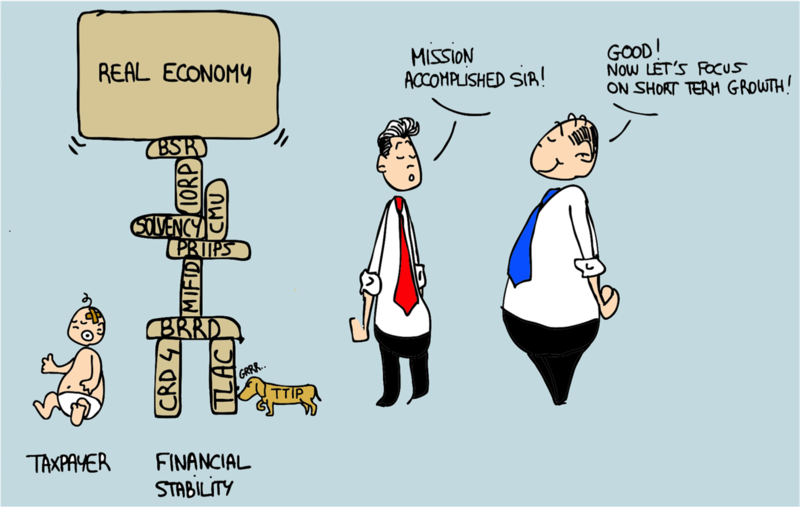 However, the CMU is unlikely to achieve much vis-a-vis these objectives if it creates new and sharpens existing sources of financial instability. If “simple, transparent securitisation” is the panacea, why haven’t markets embraced it already? Could it be the opaque legal engineering and tranching that makes securitised products attractive to investors? In this perspective, recent suggestions that public bodies -such as the European Investment Bank – could guarantee junior and mezzanine tranches of synthetic securitisation suggests that the concept of ‘simple, transparent’ securitisation may be loose its original intent, and socialise private risks (again). Furthermore, where securitised products are funded through repo markets, systemic risk increases. If collateral is allowed to flow freely, as envisaged by the CMU, well-known effects of procyclicality and interconnectedness will increase considerably. The CMU’s rethinking of shadow banking encourages us to think of market liquidity as a key prerequisite of financial market efficiency and economic growth. But recent crisis experience shows that market liquidity easily evaporates in times of crisis. This is why regulators have recognised that the complex, volatile market liquidity and excessive leverage funded in repo markets are two sides of the same coin. Freely flowing collateral would make liquidity more not less fragile. This is why the Financial Stability Board (FSB) has proposed a framework for reducing the systemic vulnerabilities of the repo-liquidity nexus. Although the CMU ostensibly aims to reduce banks’ dominance in European finance, it risks achieving the opposite. Bank separation proposals are currently at risk because the banking industry is gently persuading policymakers that such measures would undermine its role as market makers and providers of market liquidity. Since the CMU increasingly organise European finance around market liquidity, it may inadvertently increase the systemic importance of banks. Assuming that the CMU is irreversible, we urge careful thinking on three issues. First, how can new securitisation be organised so as to best promote transparency and contain systemic risks? A pan-European regulatory agency tasked with standard-setting and prudential oversight could prove essential. Direct supervision of European capital markets should not be considered an ”unhelpful distraction” that adds little to well-functioning national supervision, when national supervisory approaches are far from either convergent or consistent. On the contrary, it is worrying that European member states dismiss the cross-border nature of systemic risk only six years after the crisis of global finance. It is worth remembering that the same arguments about national supervision of large European banks left member states woefully unprepared for the crisis of European banking after Lehman. Second, the CMU should be accompanied by fundamental reforms of European repo markets, adopting the original FSB proposals (universal minimum haircuts) that targeted the sources of procyclicality and excessive leverage across all types of securities financing transactions. Otherwise, the reporting and transparency framework proposed by European regulators will have limited structural impact. Last but not least, European regulators would be well-advised to consider the desirability of less liquid markets that create incentives for buy-to-hold investors.